You asked and we heard: New features to make your Workato experience even better! You asked, and we heard! We’re excited to announce our latest update that will make using Workato simpler, faster and more efficient. Two new features will allow you to drag and drop recipe actions and make writing your recipes more dynamic than ever before. Now, creating or customizing your recipe is a breeze! When you are dragging and dropping your actions, you’ll want to pay special attention to the drop points that are marked by a blue line. If you drop your action at the farthest left drop point, your action will skip all nested actions and land underneath them. NESTED ACTION: A nested action is a subset action of a parent action (conditional action or repeat action). They are indented to the right in a Workato recipe. If you drop your action on the drop point that lines up with a nested action, your action will also become a nested action. When you drag and drop an action that has nested actions, the entire block will move with it. BLOCK: A block is a group of actions that must exist together because of “nesting.” In the photo below the section outlined in blue is a block. You can also clone your recipe’s steps with the click of a button. This makes complex recipes with multiple step easier to create. Additionally, for all QuickBooks Online users, we’re pleased to inform you that you can now search for your customers with more than just the Customer ID. Use their email address as the field to find your customers. 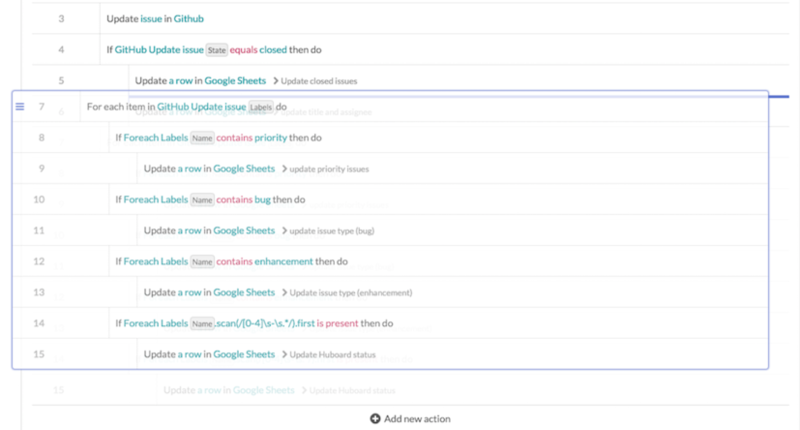 We hope these changes will help make your Workato experience a better one and help you save more time and money when integrating your applications. As always, we value your opinion and welcome your feedback on these changes! Like to do more with Workato? Contact us and schedule a time to talk to a professional services advisor. Call 1-844-469-6752 or email us at services@workato.com.